Above All Transportation may, at its sole discretion, obtain pre-approval of charges for any reservation made and secured by a credit card. A recommended 20% tip added for your convenience. The payment of this recommended tip is subject to your complete discretion and may be increased, decreased or eliminated entirely. Any tip received will be remitted, in full, to the chauffeur. Two-way tolls, airport, vehicle parking and regulatory fees. When appropriate, an additional fee for meals and/or overnight accommodations for the driver may be added. Airport greeters may be requested for an additional fee. Extra stops that occur with “Transfer” reservations (see Vehicle Rates). All rates are quoted and billed in U.S. dollars (USD). Due to fluctuation in currency exchange rates, all US dollar (USD) equivalents of international rates may vary. Parking costs at stadiums, concert venues, etc. are to be reimbursed directly to the driver, in cash, upon arrival at the venue. 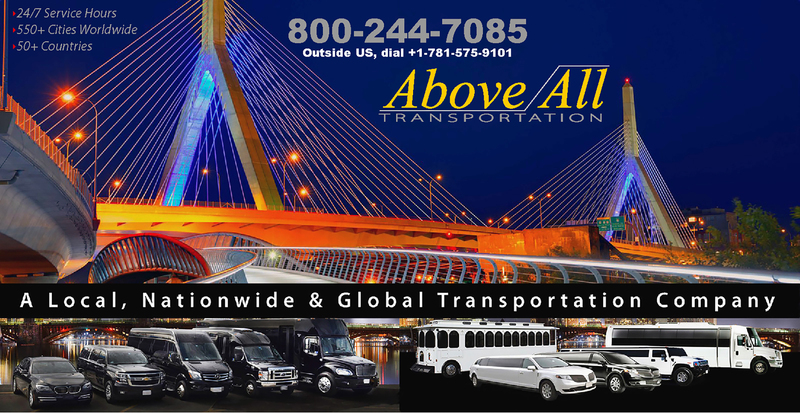 Above All Transportation has point-to-point transfer rates that provide flat rate pricing for one-way travel from point A-to-point B (i.e. Brookline to Logan Airport). Extra stops within same city/town as either the pick-up or drop-off location are billed at $25.00 per stop. Rates for travel between locations in which a point-to-point rate does not exist will be billed at the set hourly rate for the type of vehicle reserved. A two-hour minimum for sedans and a three-hour minimum for SUVs applies. All other types of vehicles carry a minimum-hour reservation requirement based on the vehicle type and day of service. Our reservation agents will disclose the applicable hourly minimum when a reservation or rate request is made. Portal (travel to/from garaging facility) times apply to vehicles larger than sedans and SUVs. Limousine reservations require a 50% non-refundable deposit. You may cancel at any time without additional charges. A valid major credit card or Above All Transportation account is required to make a reservation. A no show fee will equal the proposed trip cost plus all fees and recommended gratuity. Cancellation fee - within MA: A cancellation fee will equal the proposed trip cost plus all fees for any cancellation made less than two (2) hours before the scheduled pick-up time for sedan or SUV service in Massachusetts. For larger vehicles, the minimum notice time period varies. Please ask your reservation agent the minimum cancellation notice time for vehicles larger than sedans and SUVs. Cancellation fee - outside MA: Any cancellation made less then twelve (12) hours before the scheduled pick-up time for service outside of Massachusetts will be charged the proposed trip cost plus all fees. Cancellation fee - outside US: Any cancellation made less then twenty-four (24) hours before the scheduled pick-up time for service outside of the United States will be charged the proposed trip cost plus all fees. Domestic flight arrivals: Thirty (30) minute, no-charge wait period after the reported domestic flight arrival time. International flights arrivals: Sixty (60) minute, no-charge wait period after the reported international flight arrival time. Non-airport reservations: Ten (10) minute, no-charge wait period at initial pick-up location. Once the wait period is over, there is a charge of $6.00 per five (5) minute increment for on point-point (transfer) jobs. Above All Transportation assumes no liability for circumstances beyond its reasonable control including but not limited to severe weather, road conditions and breakdowns, acts of God, war or hostilities, it or civil commotion, fire, epidemic, earthquake, flood; or other natural disaster; delay or destruction caused by public carrier. Above All Transportation assumes no responsibility for lost or damaged baggage, personal belongings, or any items left in the vehicle.